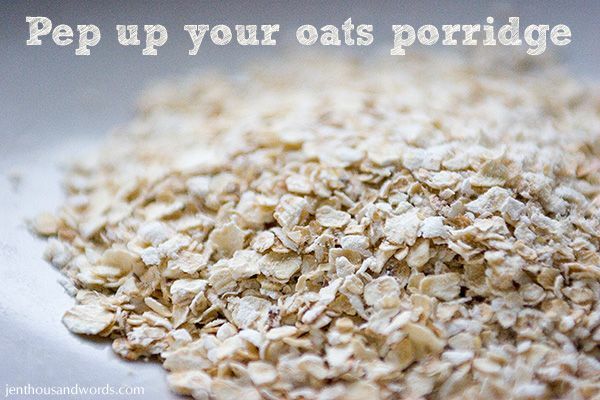 Oats are really good for you in so many ways. They are an excellent source of fibre, can lower bad cholesterol, stabalise blood sugar, help reduce blood pressure, have a higher concentration of well-balanced protein than other cereals, help prevent heart disease and heart failure, enhance immune response to disease, helps milk production for breastfeeding moms, and can even help reduce the risk of cancer. Indeed a super-food. Sure, they can be boring and tasteless. And making them less so can hike up the sugar or fat content of a bowl of porridge pretty quickly if you're not careful. 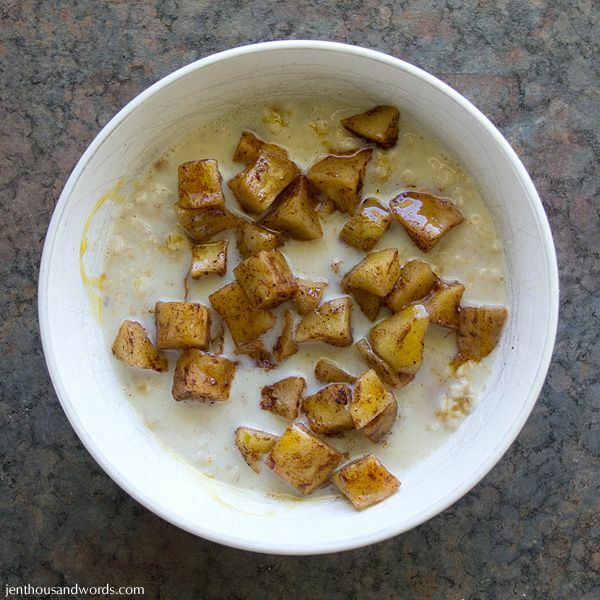 But there are plenty of ways to make a bowl of oats porridge more exciting and today I thought I'd share a few. 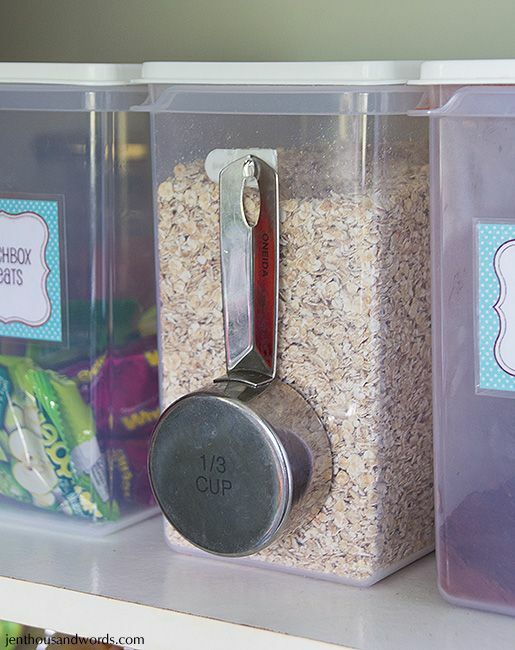 Quick tip that I learned from a pin on Pinterest: Hang your measuring cup on the side of the oats container with a little hook. I know, right?! Blew my mind too! Step 1: Put 35g (a third of a cup / about 65ml) rolled oats into a bowl. Step 2: Add double the amout of water - so two thirds of a cup / about 130ml. Step 3: Microwave for 2 minutes. Step 4: Add some skimmed milk. Simple, right? And quick too - I can unload the dishwasher while the porridge cooks in the microwave. Which is how I learned that unpacking the dishwasher only takes two minutes, which makes me less lazy to do it. But that's another post for another day. 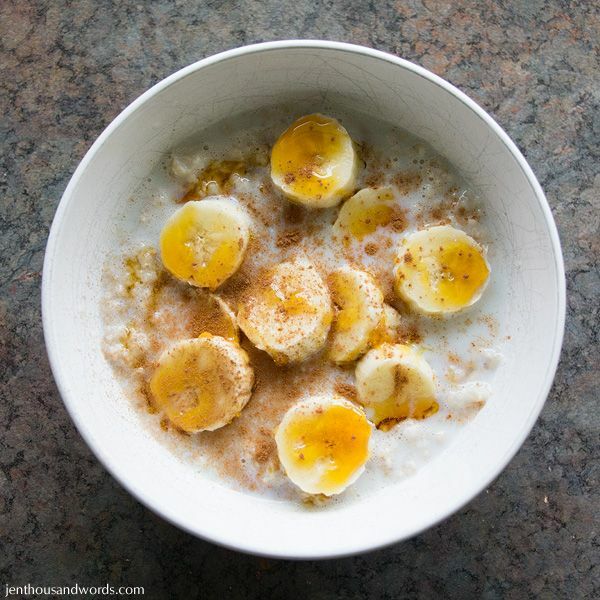 So now you have a (still bland and boring) bowl of oatmeal with milk to serve as your base. For those on Weight Watchers you're at 4 ProPoints / Points+ now - 1 for the milk, 3 for the oats. Time to add some fun. Why not top it with some fruit (in this case, banana)? And then drizzle over a little syrup and sprinkle on a dash of cinnamon. Totally delicious! And for those of you on Weight Watchers, this bowl of porridge is only 5 ProPoints / Points+ (1 for the milk, 3 for the oats, 1 for the syrup). And it tastes like dessert. Can't beat that. Then you want to kick it up with some flavouring - 0 extra points unless indicated. 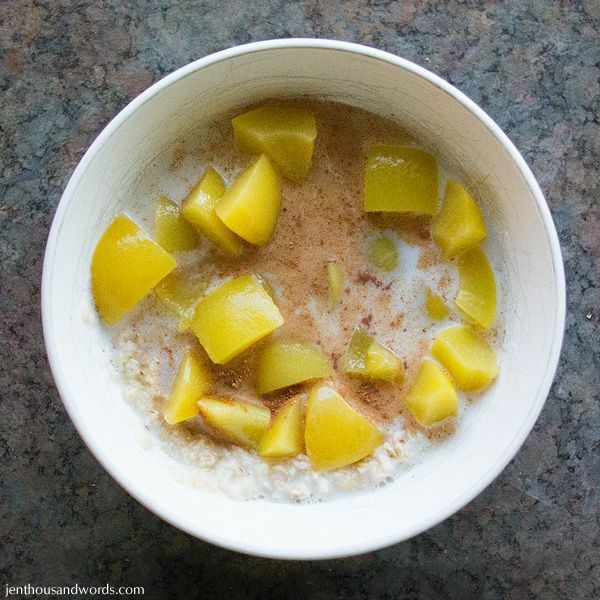 Peaches (canned in juice, drained), brown sugar, a little dried ginger and cinnamon. Banana, toffee syrup, a dash of cinnamon. Cinnamon steamed apples with a little syrup. 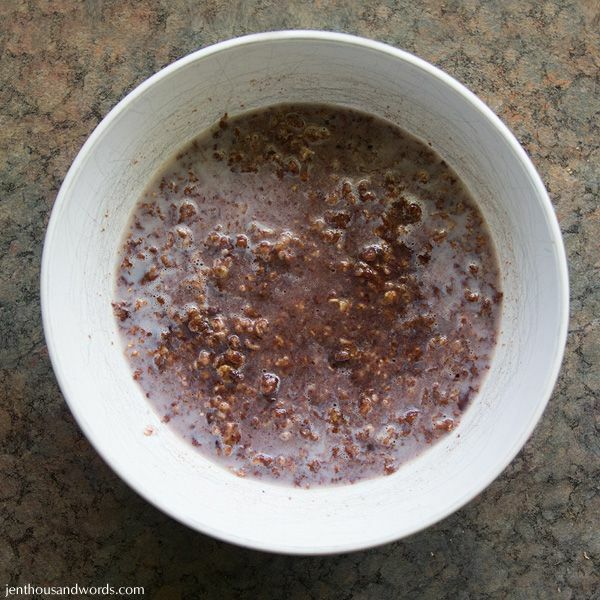 Oats cooked with a tablespoon of cocoa, white sugar. I'd love to know what your favourite combination is, or if you try any of the above. Now go forth and enjoy some porridge! 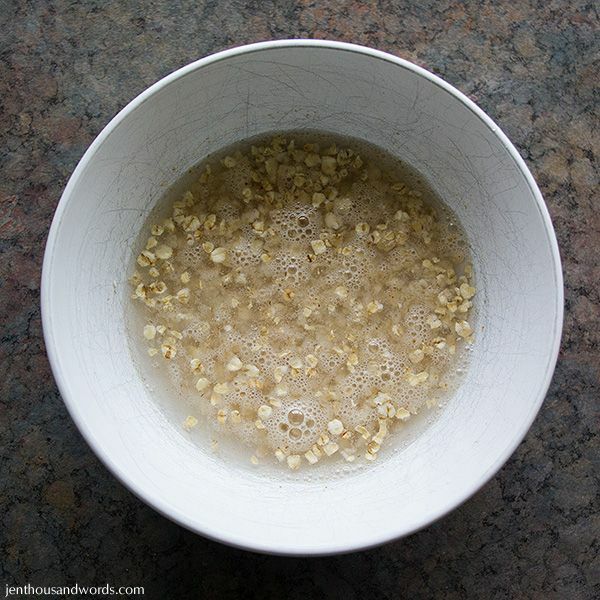 Oh, one last tip before you go: if your porridge is too hot and you're in a hurry and can't wait for it to cool, stir an ice cube through it.